8am - My decision that Scampy's brakes did not need to be hooked up, led to the hitch failure. I came to the conclusion about not hooking up Scampy's brakes because Little Honda's brakes brought Scampy to a stop so easily. However, I did not recognize that without Scampy's brakes, all of the load would be borne by the hitch. Many Readers, because of the hitch failure, are of the opinion that Little Honda should be replaced with a larger vehicle. With the above explanation in mind, I disagree with this opinion. There is no doubt that a Honda FIT is not the best tow vehicle for Scampy. So, I am going to shop for a different tow vehicle. Here is a pic of George in Salem, Oregon with our new tow vehicle! 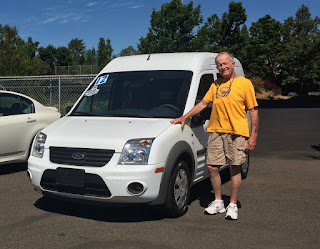 George and 2012 Ford Transit! This Ford Transit is a small size van with built-in cabinets in the cargo area that have slide out drawers! PS: Click [Here] to view page with the above specifications. We have made an Evening Camp in Bush's Pasture Park. Right after this Blog post, Little iPhone is sooooo anxious to take a walk about this lovely place. "Park closed midnight to 5am"
"OK to remain here until midnite!" 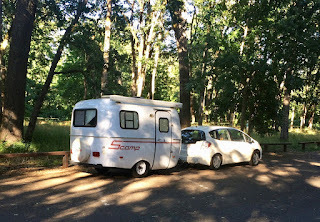 So what are the towing specs for the Honda and Scampy? Have you weighed the actual weights of the Honda's axles, trailer axle, and tongue when fully loaded. This is the only way to know if the Honda can safely to the trailer. There are more Honda specs to consider. Lots of other stuff too! It takes looking for the weakest components. I've been following your blog for well over 10 years. Just want you to be safe. A lot of people overload their tow vehicle and/or their trailer. The Owner's Manual has the specifications for what can be safely towed and it takes into consideration all the equipment the vehicle comes from th factory with. What does the Honda's manual say? If I recollect correctly you have a Honda Fit. If it is a Fit, I suspect the Owner's Manual says it is not designed to tow anything at all. The Ford Transit gets my vote. Looks like it will carry your gear and Scampy just fine. Get rid of the Honda before it gets damaged, Scampy gets damaged or you get hurt. Keep Scampy and set up your trailer on the RV lot when you're able. You've got the best of all worlds with Scampy to find adventure and the trailer as a home base. Good luck George. I fought this change for a long time. When so many told me I was wrong. I just had to listen! I like the looks of the Ford Transit and 4 wheel drive would be excellent. Lots of cargo space too. Seems like the perfect tow vehicle. As you wrote. 4WD and cargo space too! Will the Transit pull Twaylor? It would be nice to be able to go out in either one. I would not tow Twayler even if I had the proper tow vehicle. I wouldn't trust myself towing a large trailer! Looks beautiful but will it tow scampi? How much load and tow capacity does it have? Apparently this vehicle got some European awards...says it's a work horse but no other specs found on web. Click [Here] to go to a page describing the 2015 Ford Transit. I read the towing specs for 2017 which is more in depth. It has a chart for the Ford Transit Van and Wagon and each with it's own load and towing capacity. Apparently you cannot use a donut when towing, you need a full spare tire. I'm not a mechanic so I had lots of questions reading the chart for the van...what is a GCW? Is it the center of gravity? Anyway, I found the specs in google. It seems the manual transmission is not offered in America...only in Europe. Some transmission have the tow/haul gear and some don't. Like I said I had lots of questions. Here's another option George-- a basic minivan. Yes, it's pretty boring as a daily driver, but they usually get pretty good gas mileage, and many can tow up to 3000 or 3500 lbs. But the best reason-- you'd have the option to go night camping with just the minivan alone if you'd wish to leave Scampy at home. Most minivans are long enough to hold a cot, porta potti, and camping supplies with the rear seats out. Sure, it's not as comfy as Scampy would be, but it'd at least give you the option for short trips when hitching up & towing might be a hassle. Night camping in a minivan would also be super-stealthy too. The Transit Connect would be a great tow vehicle too, but I think it might be a bit too short to hold a camping cot, so you'd always need to be towing Scampy with that vehicle. Just some food for thought! Thank you sooooo much for sharing your alternate thoughts about my next tow vehicle! 2,900 pounds to 7,500 pounds for towing when properly equipped. The heavy duty towing package is an option. This is NOT a new vehicle. So "a properly equipped heavy duty towing package [whatever that is] is NOT an option. A hitch will be installed that is appropriate. You would love the Ford Transit. Our son just got one and it's great! My Ford Transit Connect does not have 4WD. I will not be doing hardly any off road RVing. Love the looks of that Ford Transit! Just noticed you bought the Ford Transit, how FANTASTIC!!! What is the tow capacity of the 2012 Transit? I suspect that you haven't gained much. Do we know how much Scampy weighs fully loaded? Something to look at and something to think about. On the next future vehicle whatever you plan on buying. The reason for that is. But not so big as to exceed your ability . Your spec sheet is for a 2017 model. Huge difference from a 2012. The specs changed in 2014. "WARNING: Never tow a trailer with this vehicle. Your vehicle is not equipped to tow. No towing packages are available through an authorized dealer." I did find that newer Transits are rated to tow 1600-2000 lbs depending on equipment. Starting with the 2014 model, Ford recommended towing a max of 2,000#. Prior to that that recommended against using the Transit for towing anything. The 1,600# figure talked about is load capacity not towing capacity. At any rate, the ground clearance is better than the Honda, more interior room and towing shouldn't be any worse than the little Fit. Commercial hitches are available, just not through a Ford dealer. Trailer brakes are an absolute must. Not only required by law, but, more importantly, by common sense. This is wonderful news for me to receive from you! More wonderful good news for me!! Wow! George my gosh the web site did say no towing for earlier models....did you ask whomever you purchased it from if the van was able to tow the scampi? Check it out before the three days expires in case you have to take it back. Go back to my Blog. I put a link there with the specs. In California the law requires brakes on any trailer weighing more than 1500 lbs. We still don't know how much Scampy weighs. Scampy has a GVWR = 2,200 lbs. I think you will find that all Class III hitches are rated at 3,500#. This has nothing to do with the rated towing capacity of the vehicle. That's just how much the hitch can safely handle. You could put a Class III hitch on the Fit but that would not make into a Ford F-150. A trip to a truly top notch trailer hitch/suspension shop would be a good place to start. No, you could NOT put a Class 3 hitch on a FIT. No such hitch is manufactured!!!!! The hitch that you looked at has specs for the Ford Transit that I bought. That is how its done! Yes, the GVWR (Gross Vehicle Weight Rating) is 2200 lbs, but how much does it actually weigh fully loaded? This is the important question along with the actual weight. Also you posted the specs for a hitch that eTrailer sells. That has no relationship at all to what Ford says it can tow. In a prior comment you stated, "Just want you to be safe." I assume that you do want me to be safe. However, I find that I am more than a bit sorry that I listened to you. "In my opinion...." in front of "That has no relationship at all to what Ford says it can tow." Maybe in 2012 Ford "didn't recommend" towing. Neither does Honda for their Goldwing motorcycles, and I've seen thousands of them. Sounds like corporate CYA. Those "naysayers" were making me feel very low! Hi George, the final say about towing is what is in the manual. I wish you the best of luck as I truly enjoy your adventures. The manual is merely a guide, not gospel. The final say is the mfg. tag on the drivers door. The final say is the man in the drivers seat. Yes, I care about your safety, which is why I have spent a lot of time doing research today. Bottom line is that anytime someone has an accident insurance companies WILL decline payment of a claim if they can prove the towing combination exceeds manufacturer's specifications, especially in cases where the payout can be tens or even hundreds of thousands dollars. And of course I don't want to see anyone get hurt. I spent nearly 50 years in the automotive and truck business, where I was known as a "subject matter expert, and have worked with the engineers who come up with these specifications. The really difficult part of matching tow vehicles and trailers is all the needed information is not in one place, and usually one cannot trust the salespeople who sell vehicles because usually their only interest is making a commission. If you do not want me to post any more, just tell me. However, you might want to read this three part article I wrote on How Much Trailer Can You Tow? I would like you to continue your comments. I had thought of making a tiny little camper in a Transit, but you can't stand up in one. Enjoy your new team mate....Trannie? "...you are a hero to me..."! There are some folks who say the trailer weight should be much less than what the tow vehicle can tow (per the manufacturer's specifications). The manufacturers of tow vehicles do a lot of engineering to come up with a tow capacity that is deemed safe to tow (assuming all other capacities such as axle weights, combined weight of tow vehicle and trailer, and tongue weight) are all within specifications. They are also a battery of attorneys that must bless the ratings to avoid financial liability to the manufacturer. So I am comfortable towing a trailer that is close to the tow vehicle's maximum specification. A lot of people are commenting here today and I believe it is because we all like George and want him to make the best decisions so he can be safe and continue to live his life on the road. Ultimately it is George's decision regarding what he is going to tow Scampy with. Can the Transit tow Scampy without problem? Perhaps. But if the Owner's Manual says it cannot tow a trailer and something happens, like an accident, there are potential liability issues for him. And perhaps nothing bad will happen at all. "And perhaps nothing bad will happen at all."